Hurlows Family Law Practice is a valued and respected Firm of Solicitors which has been serving the Cardiff and South Wales area since 2001. Going through the process of a divorce is arguably one of the most stressful and emotionally challenging processes that one can experience and you may feel as if you may not have the support that you require. This could take the form of legal support or emotional support so one can often benefit from speaking to a family law solicitor for support and consultation. Should a divorce require legal proceedings or court appearances, you can definitely benefit from being represented by a legal professional who can present your case clearly and concisely. Here at Hurlows Family Law Practice, we understand the situations that you may be going through when you are facing a divorce and are here to advise and support you. Our expert team of highly professional solicitors are specialists in family law and are available to offer you the divorce advice that you may require. In this article, we will discuss the various aspects that you may need to consider when going through a divorce as well as how our solicitors can help you in this difficult time. If you require divorce advice in Cardiff or if you are looking for divorce lawyer advice in Cardiff then contact Hurlows Family Law Practice today by calling us on: 029 2039 6087. Receiving the correct divorce advice is key to guide you through the divorce process as well as help you to navigate through the difficulties that can arise during this difficult time. Knowing where you stand legally is also reassuring as you will have the peace of mind that you are being represented fully legally. Should arrangements regarding your children or assets be involved in the procedure then it is very important to seek the advice of a legal professional so that you can be guided in how you need to proceed in terms of submitting documentation as well as agreeing aspects such as how finances are divided or allocated and agreements regarding the visitation of children. Our team are available to help you every step of the way and provide in-depth legal advice as well as offer an impartial view on how to proceed with certain aspects of the divorce. 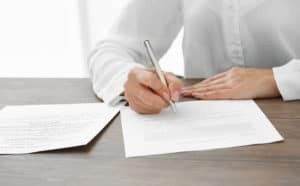 They are also available to aid you in terms of writing or helping in writing and sending court documents as well as advise you on the steps that must be followed to carry out a divorce. As previously mentioned, our team of solicitors are dedicated to family law and our highly skilled, specialist solicitors will endeavour to provide you with a professional and compassionate service. We understand that every case is different to the individual but we have most likely advised in a case that is similar to yours, which will allow us to offer you valid advice which can help you through this turbulent period. We can guide you through the divorce process should you wish to conduct proceedings yourself or deal with the proceedings on your behalf should you require this. We also highly recommend hiring a solicitor to deal with financial settlements as it is important that you are advised by a legal professional to offer legal advice regarding all of your options. Should you have suffered from an abusive relationship, you have options to apply for injunctions to protect yourself and your children from the abuser. We always deal with domestic abuse sensitively and with complete confidentiality to support you in these unacceptable situations. The November edition of our divorce advice blog discussed using divorce advice to help you during this understandably distressing time. As there’s a variety of divorce advice available and divorce is a highly stressful and distressing process, it can be somewhat overwhelming when trying to make decisions regarding a divorce. Due to the fact that it can be very difficult to reach agreements with both parties, this may make the situation even more difficult. There are a number of ways in which you can approach the divorce process which aims to avoid confrontation. Although there are websites that offer cheap divorce packages or quick divorces, it’s highly recommended to avoid these as you will still have to pay any relevant fees associated with applying for a divorce. You will also have to pay court fees should you have to argue your case in court so it’s important to be wary of companies that offer fast or cheap divorces. The speed and arguably costs associated with a divorce depend on a variety of factors, meaning that it is very dubious if an individual offers a quick or cheap divorce. If you have to make arrangements for finances, children or other agreements then the divorce process will take longer to finalise. Should you make decisions and agree to arrangements for your finances and children then the divorce process will be relatively straightforward. However this is not always the case and this is where the divorce process can become costly and a longer process. Arrangements such as pre-nuptial agreements can again protect financial agreements in the difficult situation where you are facing a divorce or separation. If you are finding it difficult to reach decisions regarding arrangements for your finances or your children then it’s highly important to try and reach an agreement before having to go to court. This is because prolonged court battles can make relations bitter between both parties and can be extremely costly. This is why contacting a family law solicitor is highly recommended compared to other methods. Companies that try and offer ‘quick or cheap’ divorce options won’t consider all of the options and should disputes have to go to court, they will not be resolved quickly and this will not be cheap. Mediation is one method for example that is used to try and reach agreements before having to go to court. Family law solicitors can advise and support you by offering mediation to try and reach decisions with both parties by providing a neutral mediator. Should you have to attend court then it’s also highly recommended to be represented by a family law solicitor. This is to ensure that you can reach a fair agreement and that you have all of the legal advice and council that you will need when attending court. It’s also understandably very distressing having to argue your case in court so a solicitor can make this an easier process for you. Should you require divorce advice then our expert team of family law solicitors are here to advise you. We have a combined experience of over 30 years and have served Cardiff and the surrounding areas for many years. We are well established and commended for our commitment to our clients and we very much wish to advise, support and guide you in this difficult time. If you feel that you require divorce advice in Cardiff or if you require a divorce solicitor in Cardiff then be sure to contact Hurlows Family Law Practice today or telephone us today on: 029 2039 6087.